Now you can learn how a successful gift basket company has not only survived, but thrived, through the ups and downs of the market, the industry, and the economy. 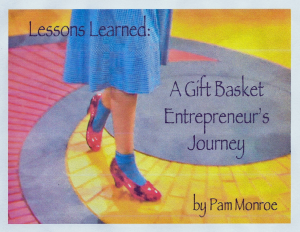 Pam Monroe started her gift basket business over 20 years ago as a part-time venture while working another job. She quit the job, her husband sold his business, and together they grew the company into one that had enough local and online business to enable her and her husband to become full-time gift basket entrepreneurs. It has been a family operated business until they decided to retire in January of this year and sold it to another local entrepreneur. In this Ebook, Pam shares many of the tips on everything from product purchases, inventory, employees, and more that she learned during 20+ successful years. The price is reasonable. The information is valuable.